Andover native, Mark Stout is a passionate chef with over 20 years experience in the Culinary Arts. Graduate of the New England Culinary Institute in Montpelier, Vermont, Chef Stout strives to remain current in the ever-changing food industry whilst perfecting the balance between trendy and classic cuisine. Stout started his culinary journey at Palmers while a high school student, working the grill and salad stations. Following high school he studied in Vermont, attained a culinary degree from NECI and moved to Florida where he picked up his panache for classic dishes with an eclectic flair. 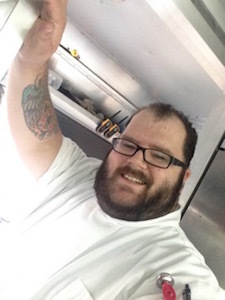 Chef Stout took a brief hiatus from the “brick and mortar” restaurant world and opened his own mobile food truck, specializing in sandwiches and featuring a weekly changing menu. Missing the allure of a free standing restaurant and working with mentor Chef Ingalls, Stout returned to his culinary roots at Palmers Restaurant in 2016 and we couldn’t be happier to have him back in our kitchen. Tina Marzolini made her culinary debut at Palmers. Having just graduated from Newbury College in Brookline, Tina joined John in the Palmers kitchen in 1998. Tina was influenced early on by Graham Kerr, TV’S Galloping Gourmet and, with her Italian heritage and passion for sautéing, Tina adds a delicious touch to the menu as well as a steadiness and grace to the kitchen. She has made public appearances over the years at The Taste of Andover and other local charity events. 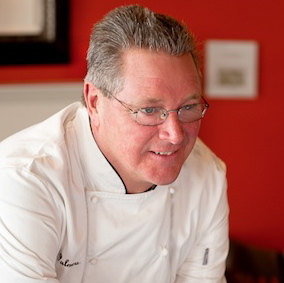 Chef John Ingalls has been cooking since childhood and graduated from The Culinary Institute of America in 1977. He carved out his place in Boston’s restaurant scene back in the 80’s when after stints in the city and on Marthas Vineyard, he established Palmers Restaurant on the waterfront in Swampscott in 1988. In 1995 the restaurant moved to its current 18 Elm Street location in Andover and the rest is history.